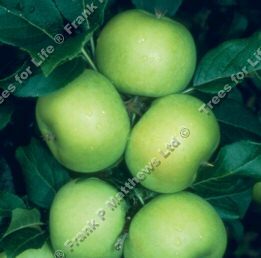 Recently introduced in 2000, Limelight (Malus domestica 'Limelight') is the result of crossing of the apple varieties Discovery and Greensleeves. The result is an improved Greensleeves type apple which is able to produce heavy apple crops. It is a neat and compact tree. The apples themsleves are clean in appearance and have a smooth finish and seem to glow when ripe with the occasional attractive pink blush. They are crisp and refreshing in taste. Of key importance is that Limelight is a very disease resistant apple variety. This apple is in flowering period is C3. It needs another apple tree nearby from groups C2,C3 or C4 to produce apples.